People watch a television broadcasting news of North Korea firing a missile that flew over Japan's northern Hokkaido far out into the Pacific Ocean, in Seoul, South Korea, September 15, 2017. WASHINGTON - A majority of Americans support military action against North Korea if economic and diplomatic efforts fail, according to a Gallup poll released on Friday amid rising tension over Pyongyang’s nuclear weapons program and recent missile launches. The survey of 1,022 U.S. adults last week found that 58 percent said they would favor military action against North Korea if the United States cannot accomplish its goals by more peaceful means first. Such support, however, was largely split along political party lines. Among Republicans, 82 percent would back military action compared with 37 percent among Democrats. Among political independents, 56 backed such action. “Half still think the situation can be resolved with sanctions and diplomacy,” and the majority of Americans doubt any U.S. military attack is imminent in the next six months, Gallup said. 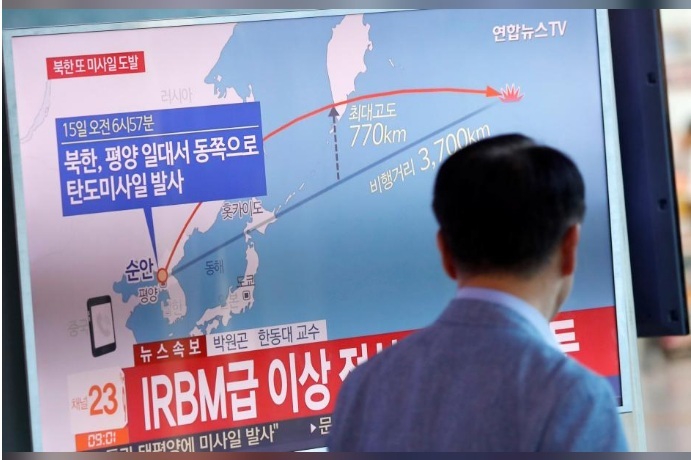 The poll findings came as North Korea fired another missile that flew over Japan earlier Friday, according to South Korean and Japanese officials. The findings were a shift from 2003, when it last asked about U.S. support for military action against Pyongyang and 47 percent said they backed it, according to Gallup. Most of the shift was seen among Republicans and independents, it added. “A sharp increase in support among Republicans - possibly mirroring President Donald Trump’s promise to respond with ”fire and fury“ to North Korean leader Kim Jong Un’s threats - explains much of this,” Gallup said. In August, Trump warned North Korea it would face “fire and fury” if it threatened the United States. The survey, conducted by telephone interviews between Sept. 6 and Sept. 10, has a sampling error of plus or minus 4 percentage points. A majority of Americans support military action against North Korea if economic and diplomatic efforts fail, according to a Gallup poll released on Friday amid rising tension over Pyongyang’s nuclear weapons program and recent missile launches.